Out of nothing but, “useless” swampland rose one of the most prestigious properties in the world. 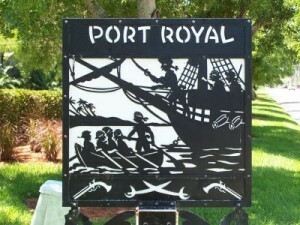 The history of Port Royal is colorful and genius all rolled into one. Everyone from US presidents to foreign dignitaries has rested their heads here, ether as guests or owners. Sample named his most ambitious venture after the infamous 17th Century Jamaican city where “privateers” and smugglers spent their spoils. Although nothing like it’s namesake in looks or pedigree, the streets continue the pirate theme with names like Galleon Drive, Rum Row and Buccaneers Roost. In the early 1950’s, heavy equipment was brought in to help fill-in the wetlands and create the long, finger-like streets separating the deep-water bays and waterways—ideal home sites for the luxurious homes Sample envisioned building on them. This was quite an engineering feat given the amount of dirt it required to make solid land on top of lose sediment trapped by the roots of mangroves. A feat, although admired for it’s ambition at the time, that would never be allowed today by the state of Florida or opposing environmental groups. The first residents moved into homes in 1952. Today, over 50 years after Mr. Sample’s vision became a reality, Port Royal and it’s homes have become some of the most prestigious properties in the world.